I’m pretty excited to answer the first question submitted by a reader. Question: Can I input mathematical symbols in Microsoft Word documents on a Mac? 3 – The symbols panel will popup. Browse through the symbols until you find the one you are looking for. You may have to switch the font to Symbols or Cambria (or any other font you like) if you don’t see the symbols you desire (Not all fonts have the same symbols). 4 – Once you see the symbol you wish to add to your document, click it so that it highlights and grows in size. 5 – Either double click the enlarged symbol to add it to the document, or click insert on the bottom right side on the symbols panel. 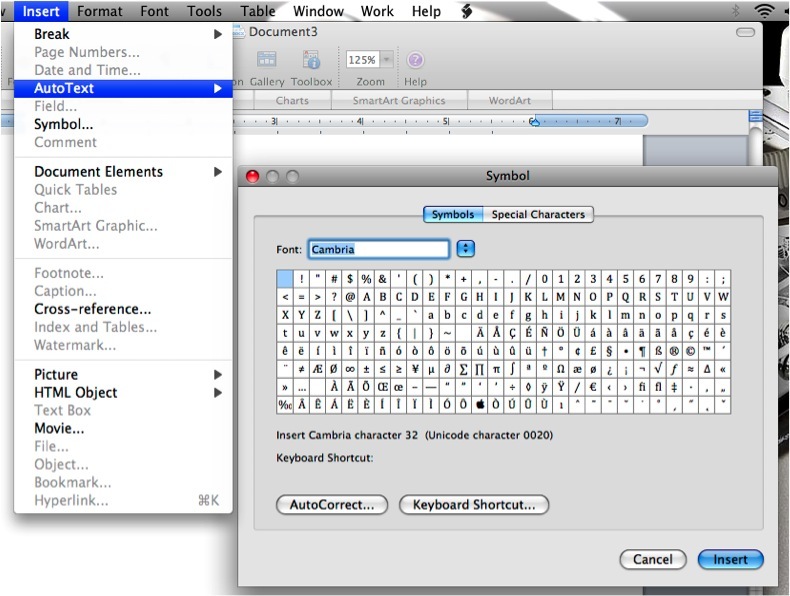 *6 – The symbol will appear where your cursor was before you opened the symbols panel. There are many more symbols, so check them out. If you have a technical or geek question that you want answered, please email me or leave the question in a comment. Hi, Thanks for that (above), I have a windows computer, im trying to do a music essay, is there any way that i can get any other symbols on word, eg. musical notes (quavers, crochets ect). i went through the symbols like you said at the top but i couldnt seem to find any, or is there none and i have to draw them in after printing? I don’t believe there is a way to make musical notation in Word. However, you can find a free musical notation program like http://musescore.org/, print screen the notes, and paste the JPGs into your Word doc (How to Print Screen: https://geekwhisperin.wordpress.com/2008/10/09/what-does-that-button-do/). I hope that helps. Good luck with the essay. Is there a shortcut for this? Thank you!